Flight or Fright Review: A frighteningly turbulent read – AiPT! “Terrifying” and “frustrating” are also apt descriptions for Fright or Flight. Ever been on an airplane when it hits some really bad turbulence? I have. It’s terrifying. And like a cliche comedy bit, it happened to me once when I was in the bathroom, too. That was more frustrating than scary. 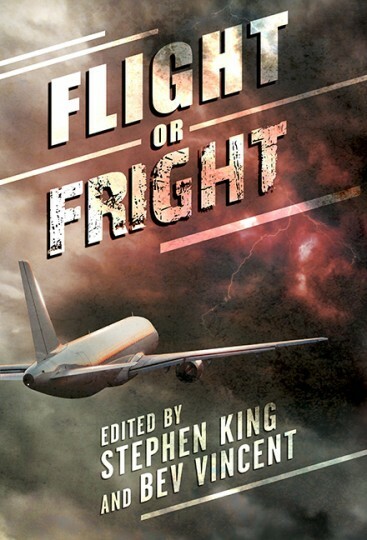 “Terrifying” and “frustrating” are also apt descriptions for Fright or Flight, a new horror anthology of stories involving flight that was edited/curated by Stephen King and Bev Vincent. Quite a bit, actually. For starters, Stephen King writes about the best book/story introductions ever. He manages to craft the anthology’s origins around some wonderful personal narratives while also making all 17 stories sound like they might possibly be the best pieces of horror literature you’ll ever read. Things start incredibly well with Cargo by E. Michael Lewis. The Jonestown Massacre was already a chilling enough event on its own, but Lewis examines its aftermath through an incredibly tragic lens that will also make you shudder and turn on a nearby light. A few chapters later, we’re treated to the classic Nightmare at 20,000 Feet by Richard Matheson. You remember that one, right? Gremlin on the wing of the plane that causes William Shatner and/or John Lithgow to have a complete nervous breakdown? Well, it’s even better (and exponentially more riveting) in Matheson’s written word. Lucifer! by E.C. Tubb is the sort of science fiction horror tale that sneaks up on you with how good it is. I wouldn’t necessarily call it a slow burn, but it methodically builds a narrative trap that springs on the last page with a gut punch of a conclusion. The real gem of the anthology is found in the middle with Joe Hill’s You Are Released. Instead of a supernatural source, the horror is derived from something that could very well happen any day now, all observed by people trapped at 20,000 feet in air. The character work is astoundingly good. I’ve read entire book series where I didn’t love and care about the characters this much. I was prepared to hate Zombies on a Plane, mostly because I’m absolutely sick of the shambling undead genre (thanks, Walking Dead). To author Bev Vincent’s credit, he crafts a thrilling tale that made me remember just how much I used to enjoy zombie stories when the genre (and the corpses) were still somewhat fresh. And then of course there’s Stephen King’s entry, The Turbulence Expert which honestly wasn’t as good as I was expecting/hoping, but mostly because it felt like the start of a really good story instead of a self-contained tale. Still, it comes with all the fantastic character work you expect from King, this time in the claustrophobic setting of an airliner. I will say that The Fifth Category (a hard look at the use of torture in combat) and Two Minutes Forty-Five Seconds (a blood curdling mix of engineering genius and soul crushing guilt). seemed like the type of story I would like, but just didn’t work for me in the end. The Horror of the Heights had some cool moments, especially for a Lovecraft fan like myself, but eventually overstayed its welcome. Otherwise, the rest of the stories would have done more to help me fall asleep on a plane rather than grip my armrest in fear. I really wanted to make a turbulence joke here about how uneven the stories in this anthology are, but I’ll spare you my subpar comedic stylings. I still think the book is worth a purchase for the good ones, especially Hill’s. However your opinion ends up aligning with mine, I’d bet we can both agree that Fright or Flight is a much better and more edifying read than than Sky Mall. An uneven collection filled with tales that will either make you grip your armrest in fear or fall asleep before the in flight movie begins. You've probably seen the Twilight Zone version of 'Nightmare at 20,000 Feet,' but the short story is even better. Surrounding the gems in this anthology are some okay tales and a some incredibly boring clunkers.